In conjunction with Purdue Veterinary Medicine’s participation in the university’s United Way Campaign, PVM volunteers got creative in dreaming-up clever ways to boost fundraising efforts. This afternoon will be the third of three “Ice Cream Fridays.” From 2:00 – 3:00 p.m., volunteers will be offering two scoops of ice cream for $2 on the ground floor of Lynn Hall, in the atrium area below the main staircase on the building’s east side. In addition to traditional ice cream flavors, the team also has some non-dairy options for those with dietary restrictions. 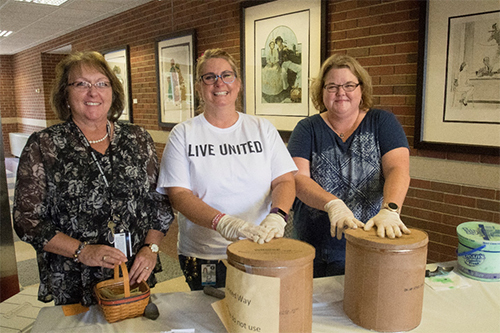 PVM United Way volunteers (left-right) Barb Cochran (VAD), Andi Waibel (BMS) and Stephanie Bonebrake (VCS) team-up to conduct a successful “Ice Cream Friday” event in support of the Purdue United Way campaign. PVM United Way volunteers serve-up sweet treats during the Ice Cream Friday on September 15 in Lynn Hall. 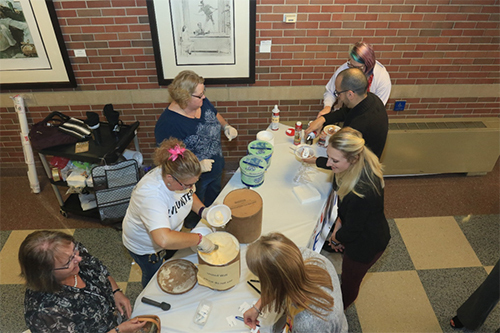 It was the second of three ice cream fundraising events planned to support PVM’s participation in the Purdue United Way campaign. The photo contest winners will be announced October 2, 2017. The Purdue United Way Campaign's theme this year is "United We Win." PVM Dean Willie Reed is this year’s campaign chair.